Jay Johnson: The Two & Only! This unique, solo show with the original Broadway cast ensemble of imaginary characters is not like any comedy or Broadway show you have ever seen. 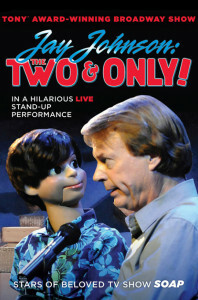 Jay Johnson is a master storyteller and ventriloquist who redefines, re-imagines, and reintroduces you to the wonderful art of ventriloquism. This big screen adaptation of Jay Johnson’s amazing Tony Award® Winning Broadway show is directed by Bryan W. Simon, produced by Marjorie Engesser, co-produced by Sandra Johnson and executive produced by Jay Johnson, Timothy T. Miller, and Bryan W. Simon. I strongly recommend this DVD and trust me, it is worth going out of your way for. Jay Johnson: The Two and Only! is genuinely touching! The audience screams with laughter! A joy! A delight!